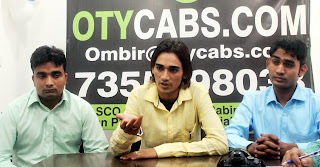 Chandigarh 04th May:- OTY Cabs unveiled its second branch in Global Business Park, Zirakpur today. A cab service, which provides all sorts of transportation facilities, from party bus to a luxury car. With their experienced and skilled drivers, these cabs ensure comfortable and convenient experience. OTY Cabs has all range of cab services like regular cab service, rented cabs, luxury office cabs and special arrangements for large events including service to the airport, wedding, casino, sport event etc. The ribbon cutting was done by Raghubir Singh. Important invitees present on the occasion included Ram Kumar, Ajay Chopra, Sombir, Amit, Vicky, Rajesh, Sukhwant, Guljar and Balwan Singh among others. Ombir Singh, Director, Chandigarh branch, who is also a martial art expert, said that he is happy to announce the expansion of our cab services. We ensure our clients a comfortable and safe traveling at affordable cost. The company also provides jobs and earning opportunity to people. Drivers with their own cars can associate with OTY Cabs to get a fixed earning of Rs 20,000 to Rs 60,000 per month, besides getting free insurance for the family and many other benefits. Independent taxi owners can join the cab service as an associate.